Today was a day of rest …Sunday, but restless me wanted to hike and explore new trails. So after having a humongous breakfast at Classifieds, Stanley I decided to walk up the escalators of Stanley Plaza and I crossed the road. I kept walking and passed two parking lots till I came to a small slope. I was scared to venture into the unknown as I had passed signs of ‘Beware of Boars 🐗’ and ‘ Do not feed wild animals’ on the way. But I said my prayers and climbed up the slope. I continued up the slope and came across lovely flowers , red leaves and lush greenery. I came across some trees uprooted but that didn’t stop me, I continued to climb. I came out on Stanley Gap road and spotted this old tree on a dilapidated structure to my right. I then turned left and walked to the sitting area just after Headland Road sign board. I crossed the road to the bus stop on opposite side and found a set of steps. Curiosity got the better of me and I climbed up these not so steep steps. At the end of these steps I reached the top which was the Stanley Catchment Water Reserve but instead of going right towards Wong Nai Chung I went left and continued walking. I caught sight of these pretty trees with red leaves . I continued walking …. I got a glimpse of Stanley from above. Spotted some pine cones atop the fir tree. If I was Tarzan I would swing on this. I walked and walked till I finally reached a bridge. There was an intersection-between the Twin peaks that’s Stanley peak and Violet Hill ( will cover in another blog). 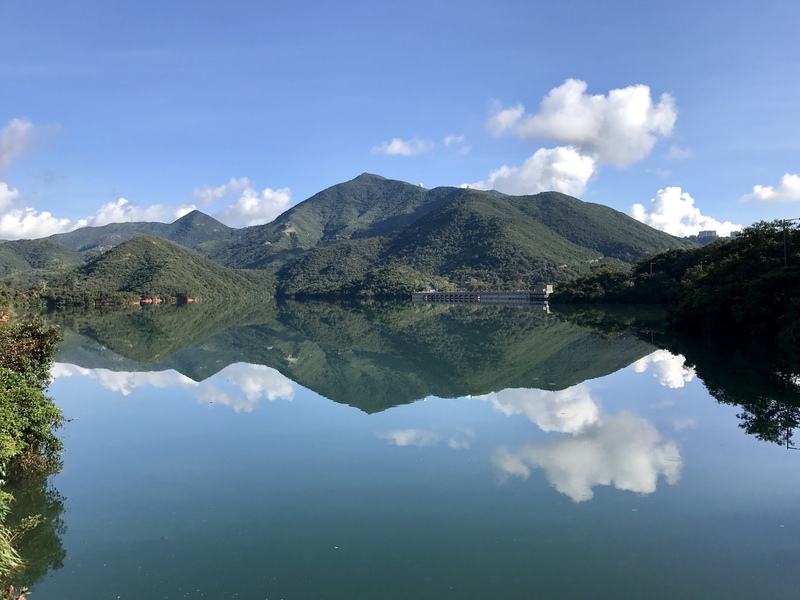 I saw a sign stating Tai Tam Tuk Reservoir and decided to follow it. It was a lovely rugged , rocky path just the way I love it. I continued walking and then I reached the normal Tai Tam Reservoir path near barbecue pit number 3. Finally I reached the Tai Tam bus stop waited for my husband and son to pick me up and had a lovely taxi drive home by a sweet female taxi driver. You can take your kids they’ll love it. How to get there- from Stanley plaza just keep walking to your left up Cape road till you pass two parking lots and spot the tiny slope. Duration- nearly 1 hour 35 minutes at a quick pace. It’s a mix of straight, slope and rocky.